The Sycamore tree can be a very large tree with a magnificent trunk that shows a mottling of different colors (1). Its branches stretch out in long wide angles. This tree allows a perfect shade spot on a warm summer day. This particular tree is located on the northwestern corner of the Arts Center building on campus. You are able to see the campus library, art studio building and Smyth Hall when standing next to it. These large, deciduous trees are native of southeastern Europe, Asia Minor, and North America (2). Likes to grow in moist soil along streams and rivers in temperate regions (3). 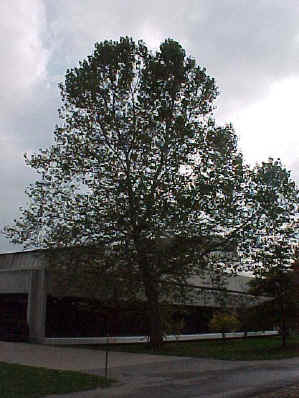 Sycamore trees grow in full sun or light shade (2). They should be fertilized every year or two and provided with plenty of water during dry periods to help prevent the attack of disease (2). The wood of the sycamore is used for furniture, flooring, wooden washing machines. Flowers: green 1 to 2 ball-like clusters that flower in May. The flowers of the Sycamore tree consist of individual male and female florets that grow on separate twigs on the tree (5). The Sycamore can live from 250 to 600 years in age (7). After 200 or 300 years the trunk of becomes hollow inside, while the tree is living (6). 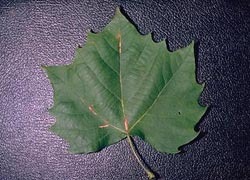 The Sycamore has the largest leaf of any tree native to North America (4). One of the largest trees to exist between the Allegheny and Rocky mountains was a Sycamore that stood on the banks of Coffee Creek, about four miles below Mt. Carmel. This tree stood 168 feet tall and had a diameter of 16 feet (6)! 5. Little, Alfred A. National Audubon Society Field Guide to North American Trees. Alfred A. Knopf, Inc. 1995, 714 pp.